Needlework System 4 will be raising their prices on April 15 (the first price increase they have had in twelve years). If you have been thinking about ordering any of their items, now would be the perfect time to beat the price increase. DMC is about to add 12 new colors to their line of pearl cotton. Initially the new colors will only come in size 5 and 8. We do not yet have them in stock but will as soon as we can get them. The new colors of pearl will be 01, 03, 30, 32, 33, 34, 35, 3799, 3844, 3846, 3847 and 3865 (colors coordinate with floss colors). Anchor tapestry yarn is becoming more and more difficult to get. In addition to colors being discontinued by Anchor, we are starting to encounter colors that our only distributor is no longer stocking due to low sales. If you have projects needing Anchor tapestry yarn, the writing is probably on the wall that at some point in the future it just won't be available for us to order. Rainbow Gallery also has one new color of Fuzzy Stuff, FZ-44 Toasted Almond (more beige to my eye than almond). Postage prices increased Sunday, January 27. In addition to increase by a percentage, there was a change in how first class packages are billed. Previously a 4 ounce package cost the same no matter where in the US we sent it, but now a local first class package costs less to send than a first class package sent across the country. This means that for lightweight items we send the greatest distance (in the US) shipping will now start at $3.75. DMC announced late in 2018 that they are no longer making Article 19 tatting cotton, Article 151 Cordonnet or Article 167 Cebelia. 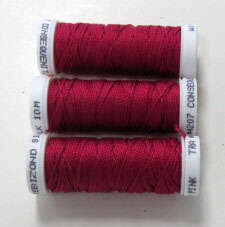 We have carried the tatting cotton and cordonnet but they will only be available while supplies last. DMC has a new floss called Etoile. Made of 73% cotton and 27% polyamide, it "pre-blends" a fine metallic filament with the cotton of the floss. It comes in a limited color range and color numbers coordinate somewhat with DMC cotton floss colors (although far fewer are available) but be warned that the colors white and ecru do NOT look like white and ecru floss. White is blended with a silver metallic so it has more of a gray look; "ecru" is blended with a warm silver and has an almost green look. 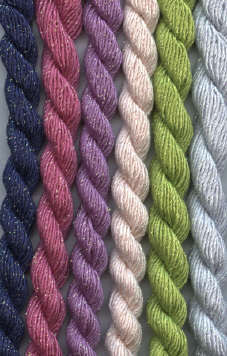 Etoile floss is $1.95 per 8 meter/8.7 yard skein. Zweigart has a few new colors of linen. In 36 count only, there is a new color called Lavender and one called Aqua or Light Turquoise. In 32 count Belfast, new colors include Honey Gold (also called Lemon Yellow, but Honey Gold is more accurate) and Federal Blue (also called Bluegray). Persian yarn from Colonial Needle now comes on 8 yard cards. This will greatly help to fill the void from colors that have not been available in the Paternayan line, which we are discontinuing. Although Colonial Persian does not yet come in all the colors of Paternayan persian, we have hopes that the line will continue to expand. While we continue to sell our existing stock of Paternayan, when colors are gone we are replacing them (when available), with Colonial Persian colors. Colonial Persian yarn is $2.00 per 8 yard card. Needlepoint stitch author SuZy Murphy has retired and her books are now out of print. We have sold out of some titles and have single copies of remaining titles, while they last. 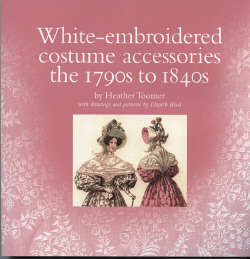 New in the store is a fourth book on historical whitework embroidery by English author Heather Toomer. 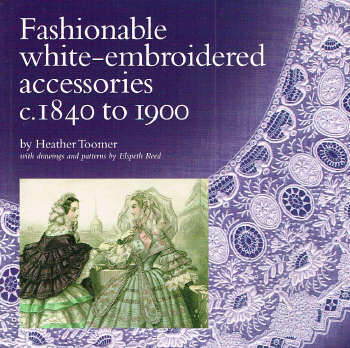 This book, Fashionable White-embroidered Accessories c. 1840 to 1900 goes forward in time from the period covered by her last book, White-Embroidered Costume Accessories: the 1790s to 1840s. Other previous titles by this author available from us are Baby Wore White and Embroidered with White. The newest book is $41.00 and is a 192 page paperback. After a long absence, the LONG Flexilens on Miniclip magnifier (with a 10" gooseneck instead of 7" gooseneck) is once again available. It is $43.00. Needlework supply prices continue to creep up this year. Among other price increases are higher prices for Rainbow Gallery threads. We also plan to raise our prices for some Needlework System 4 components very slightly in June. We have sold these items for the same price since 2007, 11 years ago. Our price is deeply discounted from "regular" retail. But the cost of shipping to get these items to us has increased every year and we need to charge slightly more for some of the components to help offset the increased cost of shipping. We STOCK nearly everything Needlework System 4 makes (except the rug frame) and in most cases in ample quantities, to make it more likely we will have their products in stock for immediate shipment, but there is a big cost to this, both the investment in actual inventory but also the cost to have them shipped to us from Florida. 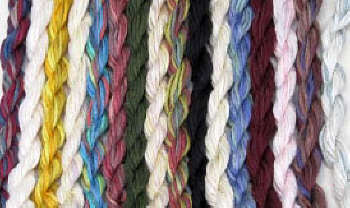 Classic Colorworks has also introduced three new colors, and has raised their floss price from $2.40 per 5 yard skein to $2.50 per 5 yard skein. In with the new, out with the old - we are told that DMC is discontinuing their product known as "Memory Thread" (thread with an inner copper wire). We are already sold out of a color or two. If you think you may have a need for this product, now would be a good time to stock up. Kreinik Manufacturing had some price increases in January. We have recently raised our store prices to reflect the higher price we are paying for their threads. 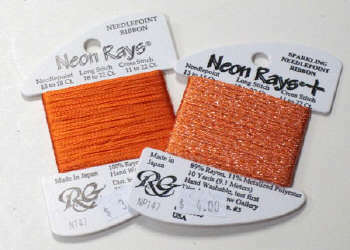 Rainbow Gallery has one new color of Neon Rays Plus, NP109 Pewter. The producers of Paternayan yarn continue to have supply issues. As of mid-January 2018 they are not taking ANY orders for about a month and are going to cancel any existing backorders for yarn that we already have on order but is out of stock. Please bear with us if you need Paternayan yarn; although we have a good amount on hand we do not have and cannot get all colors and can't even try to get more for a while. Mill Hill beads went up in price at the end of last year. We have not yet raised our prices but as new inventory comes in, the price of most Mill Hill beads will go from $1.50 to $1.60 per package (some Mill Hill beads are priced higher than this so not all will be $1.60). Gloriana silk floss comes in a few new colors (most are on backorder to us) but Gloriana has also decided to discontinue a few others. 28 count Lugana from Zweigart now comes in a pre-gridded version (we also have this in 25 count Lugana and 20 count aida). Available in white only, every tenth thread (in both directions) is a gray color, to aid in counting when doing extremely complicated cross stitch charts. 28 count pre-gridded Lugana is $49.00 per yard. The 35 new colors of DMC floss are here as individual skeins. Gift sets of the colors packaged in a tin have yet to arrive. Some of the new colors seem similar to older colors but most are not. In particular we have some new very pale shades of colors which have been missing in the past, and more balanced shades of gray (not too blue, not too brown). Also new is the first of some higher count fabrics that are coming on the market. We now have 46 count Bergen linen in white only. It is $86.00 per yard. Other colors/counts/fabric types will be here soon. The 35 new floss colors from DMC WILL be available individually, some time in November. Also in November we will be raising the price we charge for DMC floss for the first time in many, many years (decades?). During those years we have absorbed more than one price increase by DMC to us including one earlier this year. The current suggested (and fair) retail price of DMC floss is currently .87 per skein. We will still be selling at a discount from this price, but not as low as you may find it at chain stores. It takes a LOT of DMC floss sales in combination with other products to help keep a brick-and-mortar independent retail needlework store open. 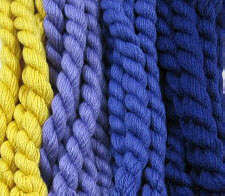 We try very hard to keep every color in stock and to keep our thread clean and cared for. In return, we need to make a reasonable (if smaller than normal) profit on floss sales. 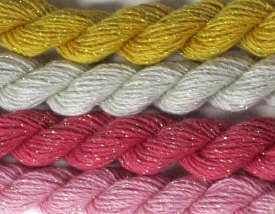 DMC will be introducing 35 new cotton floss colors which will probably be available in November. 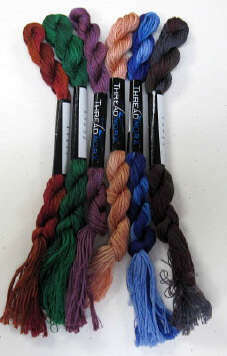 It looks like at least initially they will be available only in a gift pack of one skein per color. It remains to be seen if they will decide to sell these colors individually. 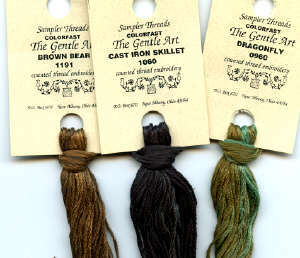 Classic Colorworks has two new colors of overdyed cotton floss: Stormy Night and Thundercloud. Mill Hill Buttons have had a price increase (the first in 5 years). "Regular" Mill Hill buttons (as opposed to buttons by licensed designers such as Debbie Mumm) are now $3.70 each. Not all thread news is about NEW products. Sadly we are seeing the demise of others. After announcing changes (reduction of yardage and elimination of all but 3 colors) to the DMC line of tapestry wool in HANKS not that long ago, now DMC has decided to entirely eliminate the production of their tapestry wool in hanks. In the future it will come in only the 8 meter/8.7 yard skein. We are also apparently no longer going to be able to get YLI silk ribbon in the future AT ALL once whatever existing stock remains in the US is gone. It is not that this is no longer manufactured, just that the demand is not high enough for YLI to package/import it any more. Other silk ribbons are available but it remains to be seen how the market will work and what people will buy. An editorial comment here: to everyone who primarily shops at chain stores or internet discounters and only goes to purchase from a specialty retailer as a last resort, those chain stores/discounters are likely NOT going to sell the hard-to-find items or have any expertise/knowledge in what they sell. We all have freedom of where we choose to shop but realize that your choices have consequences. It is increasingly difficult for the specialty store to stay in business or to sell unusual items that people may only buy once in a while, and it is increasingly difficult for the manufacturers who RELY on specialty stores to promote and stock their products to keep MAKING these products. Your shopping decisions play a direct part in the products that are going to be available to you in the future. Finishing deadlines get earlier and earlier every year (a lack of qualified professionals to do this type of work in conjunction with increased demand seems to be the reason). 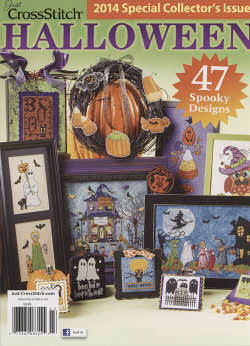 In order to get items back before Halloween, we need to have Halloween designs here by August 10. In order to guarantee to have items back before Christmas, we need to have items here by AUGUST 29. 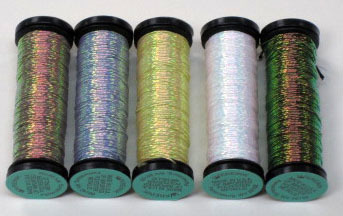 Kreinik Manufacturing has three new colors of metallic that come in most sizes. The new colors are two whites (1232HL Lavender Pearl and 2132HL Copper Pearl) and one purple (5013 Plum Berry). Anchor tapestry wool (and other Anchor products in general) are going to be more difficult for us to get in the future. Recent US distribution changes mean that we are required to place vastly larger orders than in the past. This means we can't just restock a few colors at a time but must wait until we need many colors and products to place an order. For Anchor tapestry wool in particular, another development is that a substantial number of colors are slated to be discontinued. While we will have a supply of pretty much all colors for a while, as we sell out of discontinued colors and are unable to replace them, consumers will have a dilemma. There are no suggested replacements for discontinued colors; they will just be gone. 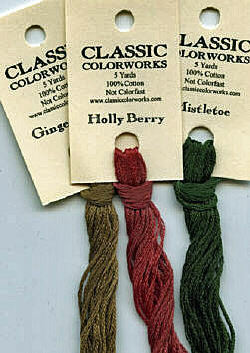 Classic Colorworks (formerly Crescent Colors) has two new colors of cotton floss: Hayride and Wagon Wheel. 5 yard skeins are $2.40 each. The designer of Prairie Schooler has released a 2016 santa chart, after previously announcing she was retiring! It is in stock and $5.00. 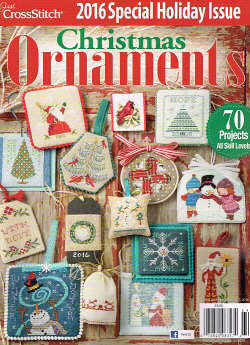 2016 Christmas ornament issue from Just Cross Stitch is also here and costs $9.99. We will be closed Saturday, October 1, during Issaquah Salmon Days. The city closes the street we are on that weekend and there is no access to our store by car as a result, which makes it a LITTLE difficult to do business! 25 count Lugana from Zweigart now comes in a pre-gridded version. Available in white only, every tenth thread (in both directions) is a gray color, to aid in counting when doing extremely complicated cross stitch charts. To test removal of the gray lines, I soaked a piece of this in plain water. It took some time but the lines did disappear. Removal might be even easier and more complete if washed with soap. 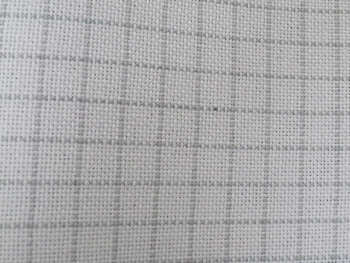 25 count pre-gridded Lugana is $60.00 per yard. Our finisher's deadline for guaranteeing items will be finished and returned before Christmas this year is mid-September. To allow for shipping time, we will need items in the store by Monday, September 12. Finishing deadlies seem to get earlier and earlier because the finishers do more and more work and this is the only way for them to manage the workload. Evertite has had a price increase on all of their stretcher bars by $2.00 per pair. Gloriana Threads has increased prices on their products. 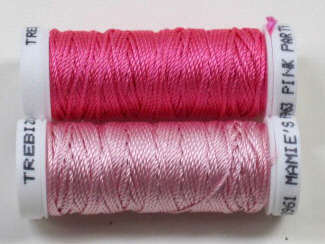 4 yard skeins of regular silk floss are now $5.60 per skein 5 yard skeins of Florimell silk floss are now $7.40 per skein. Their other products have also gone up. There is not a lot of news for June, but the GOOD news is that we do finally have all Needlework System 4 components back in stock. In THIS week's installment of do they have it, do they not (a new game show?) we now have frame clamps again from Needlework System; but now we are back to a shortage once again of lap frames. It will be mid-June at the earliest before we could have lap stands but it could take a bit longer. It's really hard to keep on top of which needlework fabrics are current and which are discontinued, particular those made by Zweigart in Germany. In the now you see it, now you don't, now you DO category seems to be 32 count Silvery Moon Belfast linen (a light silver gray). We now have this again, but who knows for how long? Also new from Zweigart (and probably also in the here-now-but-perhaps-not-later category) are two new colors in 40 count Newcastle linen, Rue Green and Soft Ivory. 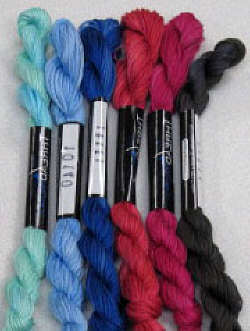 DMC has 24 new colors of cotton floss called "Coloris". They are not that different in concept than the existing Color Variations floss, except that none of the Coloris colors are monochromatic variegated; all will have more than one type of color in a skein (supposedly there are 4 colors per skein but some do have fewer than four distinct colors, unless you count lighter and darker shades of a color as separate colors). 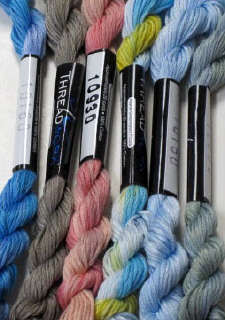 In general color combinations are very different than what you typically would find in hand-dyed threads and even other non-hand-dyed "variegated" threads. As of Friday, April 29 we have officially closed our toll-free telephone number, mostly because not a lot of people use it any more since their phone plans include long distance, but also because of abuse on that line by telemarketers. Our regular store phone number of (425) 391-0528 is not affected. Needlework System 4 is still experiencing some parts shortages (this has been a problem for several weeks now). We DO finally have most items in stock except for frame clamps. The earliest we will have frame clamps is approximately May 24. As we sell so many of these products, we will probably be in the unfortunate situation again of having to backorder some Needlework System 4 orders, due to circumstances beyond our control. We will soon be discontinuing our toll-free telephone number. Due to the nature of people now having "free" [okay, in reality it isn't free at all but part of an overall telephone plan] long distance, so few people call the toll-free number that the monthly fees to offer it are more than the usage. Once it is terminated, I suppose people calling it may be given a "this number is disconnected" message and assume that means the business is closed, which of course it isn't, but that's not sufficient reason to keep this number active. MORE of those pesky price increases. In January 2016 K's Creations had price increases on some of their products. In March Rainbow Gallery thread prices will go up. In February Kreinik Manufacturing thread prices went up. Our website/in store prices have not gone up yet on most of these but as products start arriving in the store at the higher prices, this will be reflected both on our website and in the store. Parts shortages needed to make Needlework System 4 products have existed for a few weeks now. Although parts are expected to be available soon, time needed to build products and ship them mean we will probably be unable to fill some orders immediately until some time in March. Many different products are affected by the part shortage including Q snap holders, scroll frames (all sizes), lap stands and extension pieces. If we are out of a part you would like to order, we would be glad to hold the order and fill it as soon as possible; but if you need something urgently please check with us to see if we have it in stock before you order. January 17 2016 the post office increased prices for items we send by mail. For small packages we send by first class mail in the US, the new price will start at $3.35. The good news is that the $3.35 will cover packages from 1 to 8 ounces that don't need to be insured, so it doesn't matter if your package weighs 1 ounce or 8 ounces, the shipping cost will be the same. This means a slight price increase for some packages but a decrease for others. For INTERNATIONAL packages similar pricing increases have taken place, but unfortunately this means that the lightest-weight international packages are going up substantially. It will now be a minimum of $14.00 (could be more if the order needs to be insured) for us to send anything internationally that weighs from 1 to 8 ounces. This means that it could be to your advantage to add other items to small orders as until a package reaches a weight of 8 ounces there is no additional shipping cost (except for insurance which will be added to all but small orders). Needlepoint Inc. will have a price increase February 1. 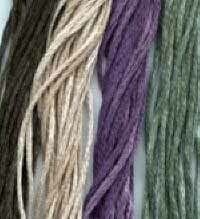 The 5 meter skeins will be $5.00 each and 45 meter hanks (normally a special-order item) will be $30.00 each. 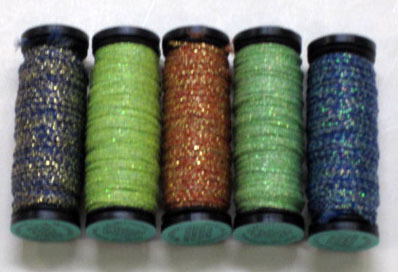 Kreinik Manufacturing will also raise prices on all their products on February 1. Friday, January 8 we will open about two hours late (at approximately 12:00 noon). Due to attendance at a trade show, we will be unable to fill mail/phone orders placed January 8 through 11, and have temporarily disabled online ordering during those days. The store will remain open for walk-in customers. As of the end of December, 2015 we can finally announce that we have EVERY single color of Paternayan persian yarn back in stock in the 8 yard skeins. It has been a difficult three years waiting for production issues to be worked out but things are much better now than in the past. Prices up, prices down...just realized that back in August the Caron Collection raised all of their thread prices. They have just now (November 14) been changed on our website. On another note, SOME of our fabric prices will be going down, but it will take a while to sort through all the changes because the fabric pricing is very complicated (and sometimes not very logical). Probably just in time for prices to go up again in 2016, just because (not because we want to, just because our suppliers decide it's time or they need to do so). We will be closed Saturday, October 3 because the annual Issaquah Salmon Days festival closes off downtown Issaquah and there is no access to our store. The supply of Paternayan Persian Yarn has improved considerably in the last month or so. They aren't quite back to having everything in stock, but our number of empty Paternayan drawers has dwindled quite a bit from what it used to be. The deadline for Christmas finishing has come and gone - yes, it was earlier than ever this year (September 15), due to the volume of finishing and impossibility of guaranteeing work would be done enough before Christmas to enjoy if it were accepted later. We may still be sending items to our finisher before now and the end of the year so it will be higher up on the priority list in the new year, but please don't beg/plead/whine/wheedle for exceptions to the cutoff date; it's not fair to those who got their work in earlier and not fair to the finishers who are under a lot of pressure to get things done. Remember, there's always next Christmas. 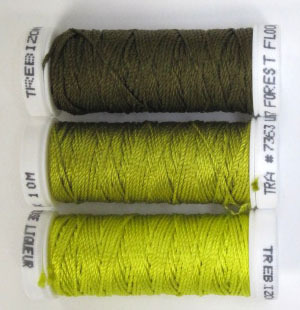 New from Weeks Dyeworks are 4 floss colors: Islamorda #2142, Persimmon #2230A, Sockeye #2249 and Wasabi #1120. They have also introduced 2 new colors in size 5 pearl (Bullfrog and River Rock) for use in the new Shepherd's Bush Christmas stocking. With the latest price increase of Gentle Art Sampler Threads and Simply Shaker Threads, the time has come for us to switch from the 10 yard to 5 yard skeins. We still have a really big inventory of the 10 yard skeins but from now on will be ordering the 5 yard skeins, unless requested by someone to get the 10 yard skeins. It will be a little confusing until all our inventory has switched over but we will have the option to divide an existing 10 yard skein into two 5-yard skeins on request (but only 1 of the 2 skeins will have the "official" manufacturer label, we will have to put our own string-tag label on the second of the 2 skeins that we make up. New colors of linen continue to trickle in. Our latest arrival is 36 count Bark Brown Edinburgh linen (a darkish khaki brown). 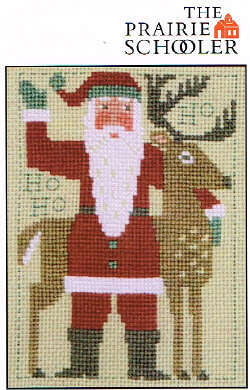 The new Santa chart from Prairie Schooler is now here, but it comes with the bittersweet news that Prairie Schooler designer Pamela Byrd Smith will be retiring from business as a cross stitch designer after 32 years so this will be her last santa ever. We just received two more new linen colors from Wichelt Imports. Now in stock are 28 count Royal Christmas Blue and 32 count Rain. Both colors are $84.00 per yard. More new colors and counts will be forthcoming. Wichelt Imports has some new linen colors. Now in stock are 28 count Chalk Board Black (very dark gray) and Brandywine (dark reddish-brown). Both colors are $86.00 per yard. More new colors and counts will be forthcoming. We have been given finishing deadlines that are earlier this year than in the past by our wonderful finisher. For finishing to be returned before Halloween, we need items brought to us by August 10. For Christmas finishing, the deadline is earlier than it ever has been (this is the only way the finisher can guarantee you will get your items in time due to the high volume of finishing they are asked to do): we need items turned into us by Wednesday, September 9. 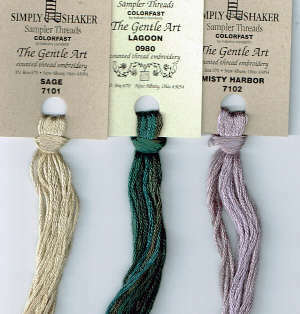 Gentle Art will be raising the price of their Sampler Threads (both Simpy Shaker and Sampler Thread lines) in July to $3.60 per 10 yard skein. Gentle Art also sells 5 yard skeins which will be $2.40 per skein; and we will probably make the difficult switch from 10 yard to 5 yard skeins in the near future, but right now we only have in stock the 10 yard skeins. Classic Colorworks comes in two new colors: Rose Petal and Strawberry Parfait. Two new colors of 36 count Edinborough linen from Zweigart are now available; the popular Platinum (also available in 28 and 32 count) and a new color called Smoke Blue (almost more green than blue). Two new colors of soie d'alger silk from Au Ver a Soie are in stock: 3324 and 3325. These purples mean this color family now has 6 shades instead of 4. Made by a family business that has been around since 1820, this silk comes in over 600 shades, and is a superior quality to a lot of the seemingly more popular "johnny-come-lately" silk threads that a lot of stitchers (and retailers) seem to be embracing while ignoring this wonderful old classic. Needlework System 4 lap stands are back in stock so we are now fully stocked with all of their wonderful products. Needlework System 4 lap stands are still in very short supply and out of stock (we got a very small shipment in April but all have sold). We expect to have plenty of their lap stands back in stock by approximately May 12. The people who make Paternayan persian yarn are still unable to make colors available to us on a regular basis (some colors have not been produced in 6 months or longer). They HAVE managed to increase the yarn price, however. Quarter-pound hanks are now $14.00 each and 8 yard skeins are now $1.20 each - that is, assuming you can get them. Needlework System 4 has Travel Mate floor stands back in stock (as do we), BUT now the lap stands and frame clamps are an issue. We hope to have enough frame clamps to last until we can get more (expected by around March 20). However, the lap stands are not going to be available to us until early April. If you wish to order lap stands, we would be glad to take your order and ship when we can; in fact, the quantities immediately available are probably going to be limited again so it is probably a good idea to get your name on the list if you know you want one soon. Needlework System 4 has been short of some parts needed to make certain of their products and while waiting for this to be resolved, we have sold out of the Travel Mate floor stands. Currently lap stands and extension pieces are also in short supply but we are pretty well stocked with other items. If you plan to order any Needlework System 4 items, you may wish to check with us and make sure we have them in stock (we're still happy to take your order and ship as soon as we can). Paternayan persian yarn is another product that has supply issues, but this one has been ongoing for two years now. Although we are certainly better stocked than we were, too often a color that we order does not come in, even after 5 or more months. Hard to understand why after two years back in business the supply issue isn't getting resolved in a more satisfactory fashion, but rest assured if we do not have Paternayan colors that you are trying to buy, it is not for lack of trying on our part. Appleton wool (both crewel and tapestry) comes in two new colors in the pastel shade range. 887 is a light slightly green blue and 887 is a light bluer blue. DMC raised prices on their products at the beginning of the year, but it is like pulling teeth to try to get a new price list from them. As DMC threads start to arrive at new prices we will be gradually reflecting those new prices in the store and on our website. Threadworx products also went up in price. The 20 yard skeins of overdyed floss are now $4.10 each. 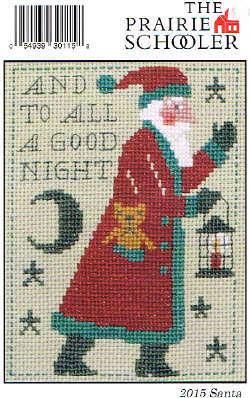 New needlepoint canvases are already arriving in the store from the major trade show a week and a half ago. You can always view the newest canvases we get (okay, AFTER we have had time to scan or photograph them, measure them, price them and post them!) 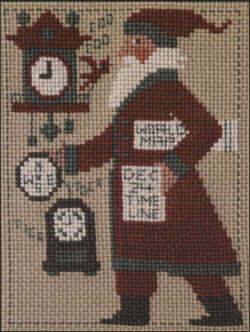 on the New Needlepoint section of our website (click on Needlepoint at the top of the page and look for the left menu item that says "New Needlepoint"). Major news for January 2015 is to report a BIG increase in shipping rates (by Fed Ex, which we use for heavier ground shipments, but we understand similar rates apply to shipments by UPS). Rates for items sent by mail have not changed (yet!). We have not yet worked out how to estimate for you in advance shipping charges this year so for heavier items or items not best sent by mail, we may need to provide you shipping estimates in advance until we can sort out how best to handle the new rates. In the meantime please use the shipping charges on our website as only an approximation; if ordering heavier items the actual shipping costs may be higher than estimated. We always charge fair amounts when we bill shipping, without trying to profit from shipping charges but also not lose money on them. Holiday hours: closed 3:00 pm December 24. Open regular hours Friday, December 26 and Saturday, December 27. Closed New Year's Day. 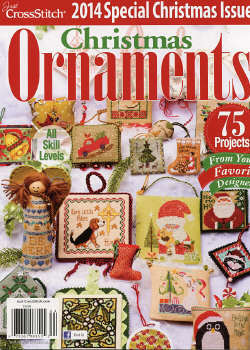 December is a quiet time for new needlework releases. 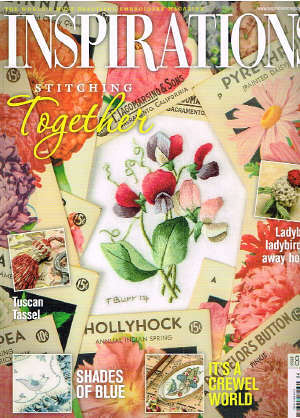 We do have in stock the newest issue of Inspirations magazine, Issue 84. January 2015 should be a time of new products or at least new product announcements, many of them timed to the upcoming trade show in Phoenix, Arizona. If nothing else, we will be ordering new hand-painted needlepoint canvases there from many of your favorite designers, which will be starting to show up in the store later in the month and continuing for the next several months (instead of getting everything at once we normally ask for our orders to be sent in batches, in order to have new items to offer over time instead of all at once, which can be overwhelming. New from Weeks Dyeworks are four new floss colors: Candy Apple, Jay Bird, Flatfish and Porpoise. SALMON DAYS CLOSURE: Once a year, on the first Saturday of October, we close because Issaquah Salmon Days (an arts festival) closes our street and access to our store by car is not available that day. This year our Salmon Days closure will be October 4. 2014 FINISHING DEADLINE: our deadline for professional needlework finishing this year is going to change from previous years. In the past we have had to have large pieces (pillows, Christmas stockings, etc.) in the finisher's hands by October 1 to guarantee they would be ready before Christmas, but we used to be able to send smaller pieces such as ornaments for another month or so and still get them back in time. This year we have to have EVERYTHING in the finisher's hands BY October 1. Because we send the finishing out of state, what this means is that the last day you can drop off finishing in the store will be September 25. 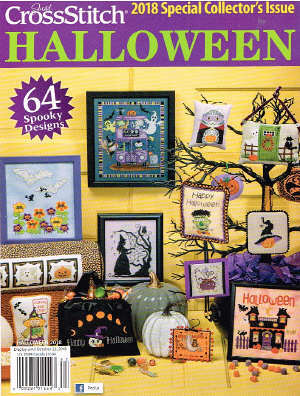 The annual special Halloween issue of Just Cross Stitch magazine is here. It is $9.99. Kreinik Manufacturing raised prices June 1 on all of their threads. Price updates to reflect this will be made on our website soon. 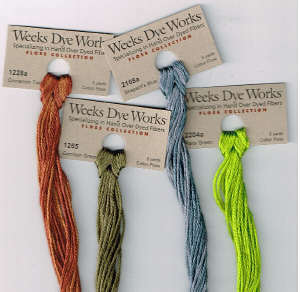 Weeks Dyeworks has raised their overdyed floss to $2.30 per skein and their overdyed pearl cotton to $3.60 per skein. Zweigart has a new color of 32 count linen - Avocado. Zweigart also recently introduced a lovely new color that comes in many of their fabric lines (including 28 count and 32 count linen and 18 mesh mono canvas) called Soft Ivory. Soft Ivory is a little darker than Antique White and a little lighter than Cream. Since many times their white and antique white fabrics are very close to one another, the new Soft Ivory is a nice option when white and antique white are a little too light and cream is a little too dark. Zweigart News - now you see it, now you don't, now you see it...a few years ago Zweigart in Germany said they would no longer make the tan/brown color of mono canvas in most counts, the exception being 13 and 18 mesh. Apparently all counts are now BACK in this color, so it is once again available in 10, 12, 13, 14, 16 AND 18 mesh (at least until they decide to discontinue it again)! Many fabrics have gone up in price, some late last year and others this year. All threads from the Caron Collection and most from Gloriana also went up in price earlier this year. N147 Persimmon (Neon Rays) and NP147 Persimmon (Neon Rays Plus). Appleton wool (both tapestry and crewel) has gone up in price (the first price increase since 2009.) 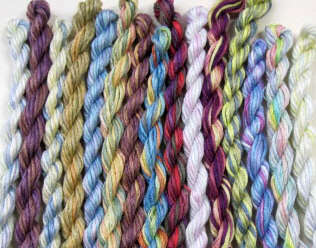 Skeins are now $2.00 each; hanks are now $7.00 each, and color cards are now $68.00 each. And yes, Threadworx floss will go up in price any day now. We will have lots of news to list here but it has been so busy in the store this month not a lot of time is left for website updating. 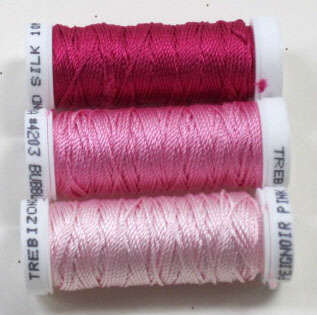 New thread colors from Threadworx and Kreinik are coming, lots of new canvases are starting to arrive (but not yet scanned or photographed or taped or priced), and other price changes still need to be mentioned. Of immediate importance to note, however, is that once again shipping charges have increased. Freight charges (Fed Ex ground) went up a couple of weeks ago, and we are still trying to get a handle on the effect of those rates and how to reflect them on our website. Then, on January 27, 2014, prices also went up for some types of mail. Not that many years ago, we could send small, light packages by mail and only charge $1.00. Those days are long gone. Most people seem not to realize that a few years ago the postal service split first class mail into two main categories. The first is normal mail such as a letter, card, or check, which require just first class postage (.49 as of today). But there is now a different kind of first class mail called a first class package. This is for bulky items or items that are not perfectly flat like a letter, and the cost for this class of mail is not .49, but postage alone now starts at over $2.00. The good news is that it is the same price to send a one, two or three ounce package, and the packages now come with free delivery confirmation, but it also means that by the time we cover actual postage, shipping label, padded envelope, and shipping software that allows your package to sent efficiently, we now have to charge a minimum of $2.75 for items sent by first class mail (for items up to 3 ounces only that do not require insurance, and only if sent to a U.S. address). We do not make money on shipping costs, but would also like to avoid losing money on shipping. Every order we sent is evaluated for the best way to ship and save you money and if we can safely send your order for a lower price, we charge a lower price for shipping at the time your order is processed. In other words, just because our shipping chart shows an estimated price for shipping based on the dollar amount of your order, you won't automatically be charged that amount if we can charge less without losing money on the shipping cost. Gloriana has announced a price increase for all their threads effective January 1, 2014. There will probably be other product lines that will increase as well next year. Crescent Colours is under new ownership and a new name. In the future, Crescent Colours floss will be known as/labeled as Classic Colorworks. Paternayan persian wool continues to come in, but slower than we would like. Another 40 colors in 8 yard skeins arrived in November. We are told dyeing to be done in December will bring even more colors soon. Paternayan persian yarn continues to arrive. Although not all colors are available yet, we are receiving more colors all the time and are assured to expect all colors to be available by the end of the year, with color cards next on the list for production. 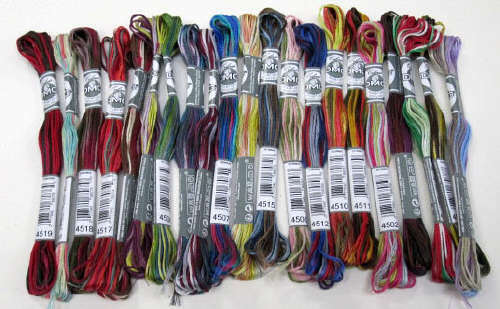 DMC has 16 new floss colors that we now have in stock. Initially they are only being sold by DMC in gift boxes with one skein of each color (box includes some free charts for designs that use the new colors). Needlework System 4 is currently experiencing a shortage of parts needed to make up their products. Although we are well stocked with most items, we may run out of a few before we are able to get more (probably toward the end of September). If you need any of their items urgently, please contact us prior to ordering to verify that we have them in stock for immediate shipment. DMC new floss colors are expected in October. Initially they will only be available in gift boxes containing one each of 16 colors. We are told that in 2014 individual colors will most likely be available. Paternayan persian yarn is supposed to have a major number of colors available also in October. Although we have received several small shipments since this yarn became available again earlier this year, a large number of colors have yet to be dyed. We have great hopes that we will have most or all colors available again some time in October. Prairie Schooler's annual Santa card is here. This graph is $4.00. On another note, several colors of Impressions thread from the Caron Collection will not be available until the end of July. Paternayan persian yarn continues to arrive in our store to restock empty drawers. Many colors have yet to be dyed but we are seeing steady progress and getting 25-50 more colors every few weeks. Copyright 2013-2019. All prices are in U.S. dollars and are subject to change without notice.